File cabinets, carpeting, office furniture and building material are all visible in the demolished northern facade of the Alfred P. Murrah Federal Building in Oklahoma City April 19, 1995. Like our shared 9/11 experience, the day of the truck bombing of the Alfred P. Murrah Federal Building in Oklahoma City started, for me, on television, 20 years ago today. 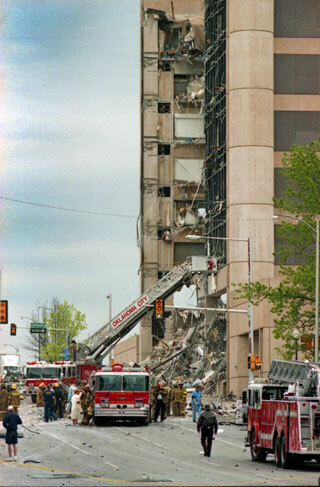 Fire and rescue crews search the destroyed Murrah Federal Building in this view from the west April 19, 1995. Since it happened in the morning, my newspaper coworkers and I were putting together the daily on deadline. I came out of the darkroom with a print for an editor and saw everyone crowded into the conference room, where the television lived since that’s where the cable enters the building. I stuck my head in the door, just like I would do six and a half years later on 9/11/01, to see everyone’s eyes glued to the images brought to us by Oklahoma City television stations. The destruction and chaos looked to me, initially, like an underground gas explosion we’d seen on television some years earlier in Mexico, and my first take was that Oklahoma City must have experienced a similar disaster. Immediately we decided to hold the front page, and waited for stories and images to arrive from the Associated Press. At the same time, our editor decided we should have some stories and images of our own, so my news editor and I hit the road. We arrived in downtown Oklahoma City at around 11:30 am, by which time the entire scene was locked down pretty hard. Still, we were able to get ahold of a local state representative, who we interviewed, and I was able to see most of the demolished building with my 300mm lens. 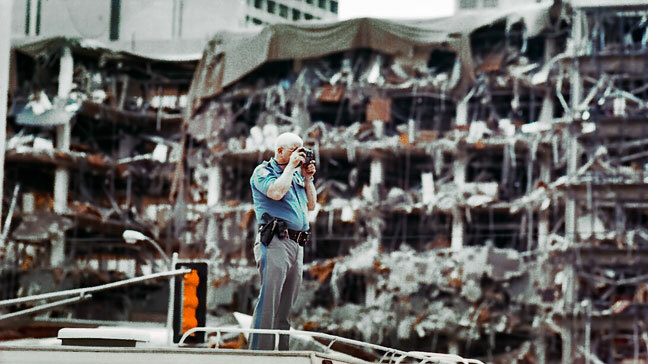 A police officer takes a picture from atop an emergency command vehicle with the bombed Alfred P. Murrah Federal Building in the background. One thing I’ve learned as a journalist over the years is that in situations like 9/11 or the Murrah bombing or Ada’s Evergreen Mill fire in March 2000 is to do my job as quietly and transparently as possible. People in those situations and witnessing those situations are emotionally raw and frequently irrational, and no opinion of mine will improve that. So I remain as quiet as I can, and I make pictures as inconspicuously as possible. I visited the site of the bombing a couple of years after the event, and again in about 2000. I also took my wife Abby to visit the site, now known as the Oklahoma City National Memorial, in 2008, and she found the experience quite moving. 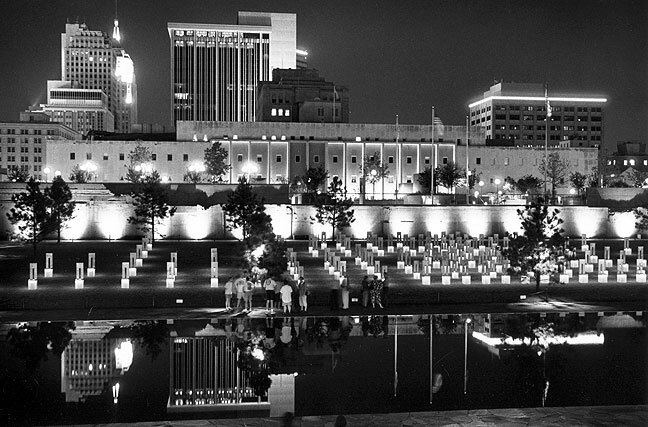 I made this image of the Oklahoma City National Memorial in about 2000. As you can see, it is an elegant, fitting tribute to the event. For me, the two event had almost no similarities, much of that due to being several years younger than you. 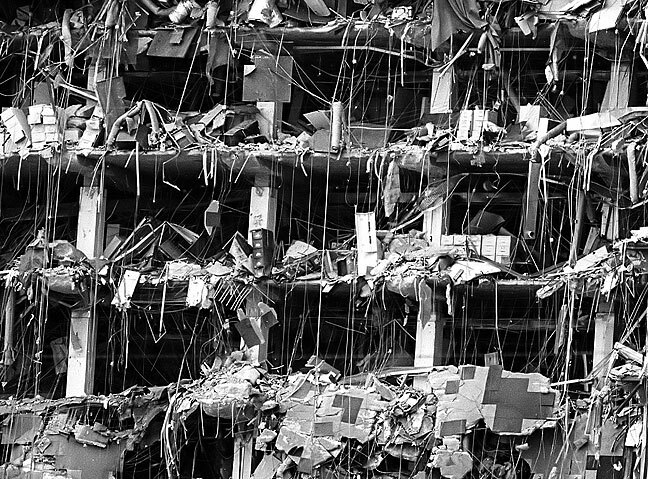 For the OKC bombing, I was still in college, with no easy access to TV. I didn’t even mention it in my journal. Six years later, I was a different person, in a different state, with the toughest five years of my life just having finished. First thought upon hearing: “I wonder if my brother’s there”. I was 17 and in high school. We were all moved to our home rooms to watch the coverage. Then a blood drive was created we all wanted to do something so at 17 with parents permission we could give blood. Which set me on a road to becoming a loyal blood donor today! “So I remain as quiet as I can, and I make pictures as inconspicuously as possible.” I wish all media were this kind and understanding. I remember hearing about it in Dallas and immediately thinking about driving to OKC to cover. As I was considering it, the NY Times called and asked me if I could cover it along with some of their team that they would be flying in. I hopped in the my car and drove up I-35. A bit outside of Dallas, I saw flashers in my rear view mirror and 3 vehicles passed me at around 100 mph. The first was an unmarked blacked car, the second was a yellow Ryder van, the third was an unmarked car like the first. I figured they were feds with supplies or fed bring a truck like the one used in the bombing. I decided to speed up and follow them at a comfortable distance. It was my first ever Dallas-OKC trip. The site was a block from where the AP used to have their office. Seeing the building for the first time was breathtaking in a BAD way. Surreal.